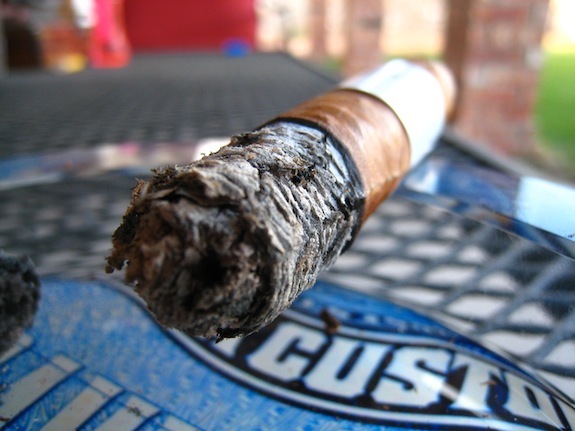 Prelight: Cigar #8 is a nice, heavy, corona sized stick. 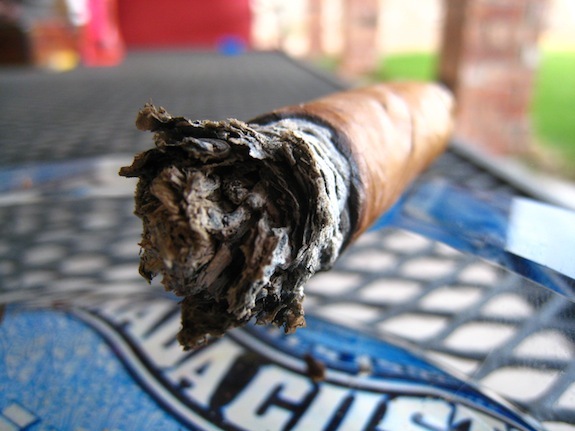 And when I say heavy, I mean this cigar has so much tobacco that it feels like it has been loaded with lead. 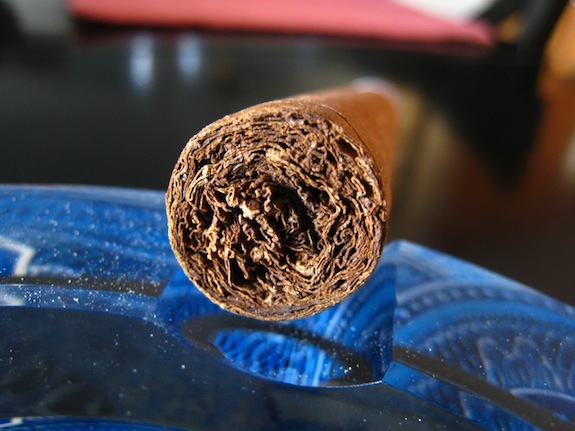 Cigar #8’s wrapper is a really nice medium brown, with darker brown and orange spots. It almost looks calico in some light. 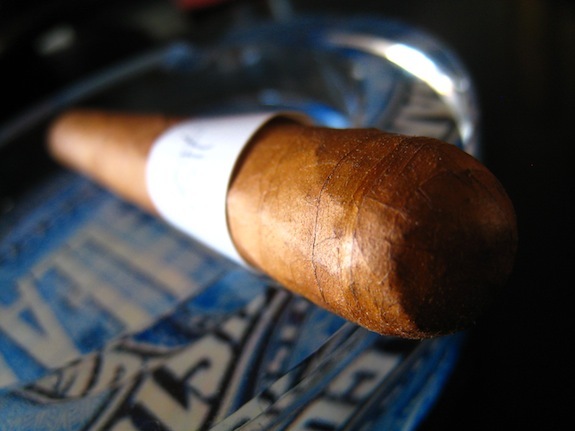 The wrapper only has one really large vein running the entire length of the cigar heading all the way up to the massive triple wrapped round cap. The cigar is all sorts of firm. I can’t find any soft spots, but the hardness of the cigar kinda worries me. We’ll have to see if it creates any problems. The wrapper doesn’t give off a lot of aroma at all. The only thing I could pick up was some slight tobacco. The foot however, is a different story. I am picking up some really neat floral and citrus aromas with some nice woodsy smells. The cap was cake to cut using my double bladed Palio cutter. The cold draw showed some unexpected signs of pepper and spice in this cigar, along with the floral and tobacco tastes I picked up. I wasn’t expecting to taste any pepper, but we’ll see if it actually carries into the smoking experience. First Smoke: The cigar really fought my triple flame torch when I was trying to light it, but eventually it was off and running. I really didn’t pick up any of the pepper I did in the cold draw, but the spice was there for sure. Almost as a cover up for the pepper, the spice started out strong but then faded into some nice cedar tones with just a hint of citrus. There is also that saltiness that I tend to pick up from the wrapper of certain cigars, but it is was too early to call this one. The draw, despite being so packed was flowing smoothly kicking out nice, thick, smoke with every puff. The ash is just beautiful, leaving behind a perfectly compacted, zebra striped, with and light grey ash from it’s flawless burnline. The ash held on a good inch before falling into my ashtray. Halfway There: It’s early, I know, but wow. This is a VERY good cigar. The flavors have remained very similar, with the cedary flavors in the forefront, backed by the floral, spice, and now some really neat coffee and cashew flavors. The retrohale is badass too priming with this deep cedar and a bit of the spice. I am not feeling any nicotine at all form this cigar, and for what it’s worth, this cigar is burning incredibly slow. Probably due to all the damn tobacco packed in this sucker. Finish: I said it, and I will say it again. This is just an awesome cigar. The spice is still holding its own, although it’s just a tease at times it seems to really chime in at just the right moments. Outside of that the cigar has remained completely smooth the entire experience finishing with strong cedar and cashew flavors. By now the floral has completely removed itself form the equation. 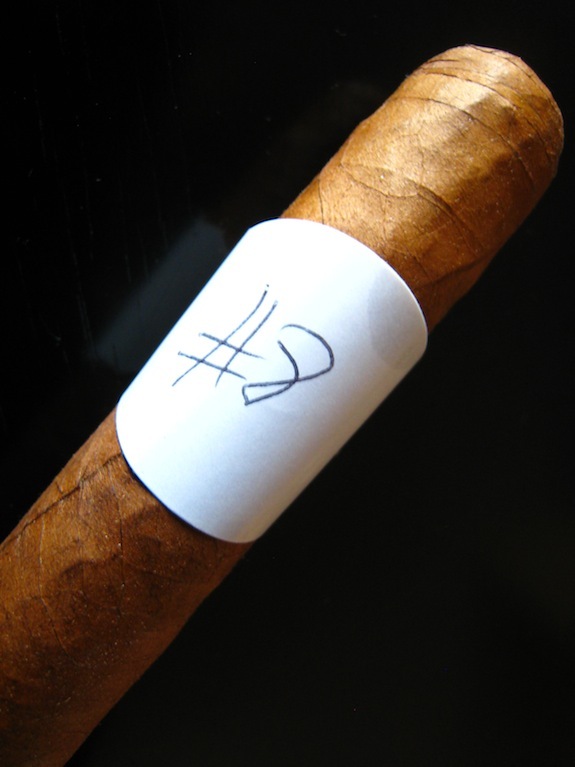 I smoked this cigar down to the nub, my fingers were burning, with absolutely no signs of harshness, just pure awesomeness. This better not be some crappy RP or I’ll eat my ashtray. Overview: What can I say? I loved this cigar. From the size, to the amazing ash and burn, down to the perfect flavors. This is a solid cigar and I’d love to have more in my humidor. I have a good feeling about this one, but then again, I am known to be way off. I though it was Cuban, then I decided it wasn’t. Then I decided again it was, then decided it wasn’t. It was like that almost the entire time. 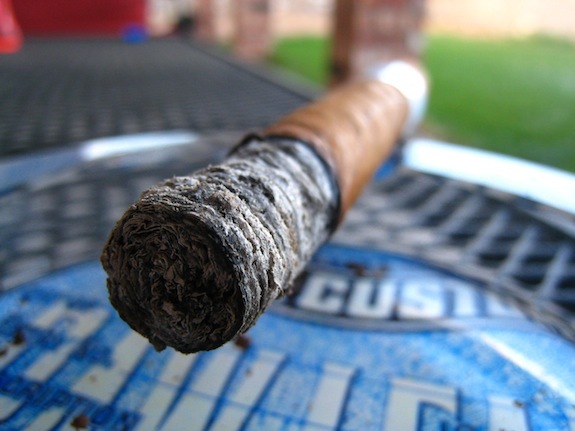 It had the visual and for the most part flavor characteristics of a Cuban, but the ash, burn, and spice aren’t something I usually find in my Cuban cigars. But then again, this is Brooks we are talking about and chances are this isn’t even a cigar I have ever had. So what did I think it was? 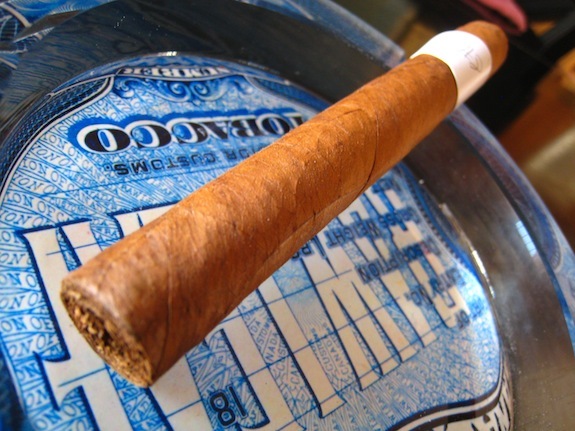 I think this is either a Partagas, or Montecristo Cuban. I’m pretty sure it’s a Cuban but if you visit one of the blind reviews from the last set you gave me, you’ll see Tatuaje threw in a curve ball as I claimed that was a Cuban cigar as well. He too could have possibly been fooled by this cigar. 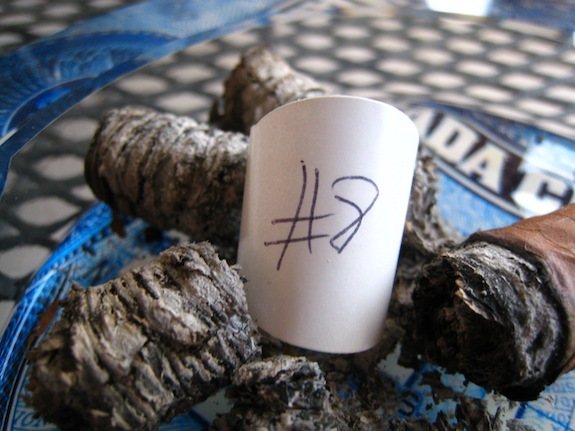 To view his entire review of the blend (pettit robusto vitola) visit this page. That’s an awesome sounding stick! Too bad its availability is so limited. Great write-up, Tony. LMAO at the RP comment! HAHA funny thing is. My next two reviews in Que, outside of the blinds are the 1844 you sent, and the NEW RP that Nimish did! We’ll see how it goes! Nice write up Tony, sounds like a damn good stick. Too bad it’s not widely available on this side of the globe. Now cut this out before I send both of you to your rooms! I have smoked three of these so far. One of them was terrible. The other two have been amazing and I can definitely see the cuban flavors in them. It has that saltiness. I really really like the Espana. I have one left in my box and I hope it is not a dud…. two out of three is not bad.. Oh yeah never mind the haters…. Daniel just ate a spoiled moose meat sandwich….